“Sworn” translation in Quebec | INVISIBLE Translation Inc. In Quebec, “sworn” translation of a document, or “certified” translation to use the correct term, is a translated document bearing the seal of a certified translator which grants it official status in the eyes of government authorities. This article provides general information on the translation of official documents in Quebec. If you need a certified translation adapted for use in Quebec, click here. For a full list of the language services we provide, click here. In the province of Quebec, certified translators are authorized by the government to produce an official translation, which some people refer to as a “sworn” translation. Since the act of swearing is a solemn oath taken by a person before a commissioner, it is the person who is sworn, whereas the translation is certified to be consistent with the original. Since a translation is not a person, it obviously cannot take an oath or be sworn. Once sealed, initialled and dated by the translator, this type of translation is officially recognized by authorities. In Quebec, the Ordre des traducteurs, terminologues et interprètes agréés du Québec (OTTIAQ) grants the certification that enables translators to produce government-approved translations. The reason for the Ordre’s existence is simple: it ensures protection of the public, in the same way the province’s other professional associations do. OTTIAQ provides members of the public with an electronic directory containing the names of translators authorized to produce a translation recognized by the government. The website of the ministère de l’Immigration, de la Diversité et de l’Inclusion du Québec contains a list of the conditions to be met for submitting a translation recognized by the Government of Quebec. To request a certified translation, you must provide us with the original document you want translated, whether the hard copy or a digitized version with a resolution of at least 300 dots per inch (dpi). One of our translators will affix the seal to the original document and attach this to the certified translation, which will also bear the translator’s seal. The translator will also produce a letter of attestation attesting that the translation was produced in compliance with accepted practices. We will send you the certified translation, the original document and the translator’s letter of attestation within one or two weeks, depending on the complexity of the work and your place of residence. Note that the governments of Quebec and Canada impose no fee scale for this act, so each translator is free to set his or her own rate. It should also be noted that producing a translation of an official document is demanding work, since the translator must reproduce the structure and layout of the original. From a blank page, the translator must recreate the original document in another language before affixing the seal and drafting the letter of attestation. For this reason, our professional fee is $125 for each official document or each page, as applicable. To determine the exact cost of your work, send your documents to: quote@invisibletranslation.com. Do you need an official document issued by a foreign government translated into French or English for submission to a government body in Quebec? 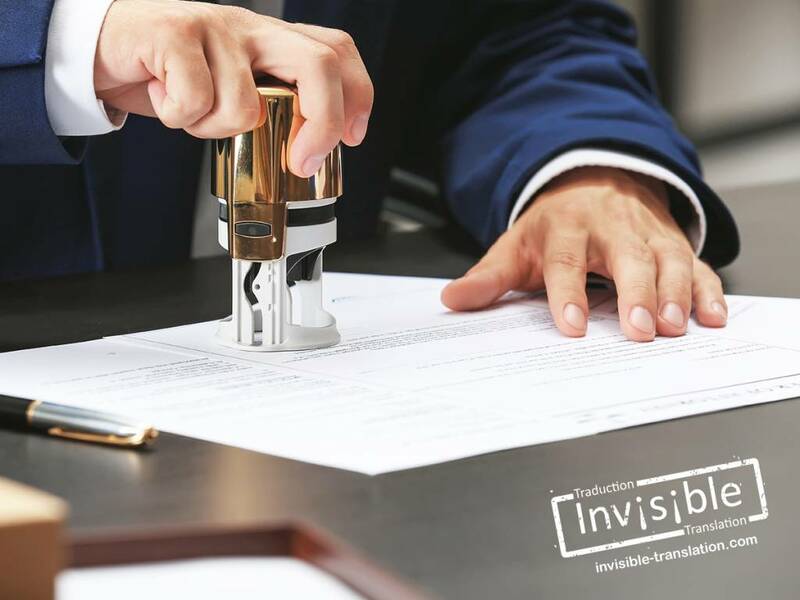 Call us now at +1 514-436-6331 or email your documents to info@invisibletranslation.com. Our certified translators will be pleased to assist you. Have you previously had to submit a “sworn” translation to a government agency? Have you had difficulty finding a reliable translator to meet your needs? Send us your comments: feedback@invisibletranslation.com.